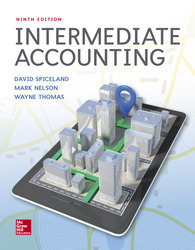 - Provides a rigorous yet readable approach to Intermediate Accounting, challenging students while ensuring they reach their maximum potential. Spiceland leverages a highly acclaimed conversational writing style, comprehensive coverage, and a clear, consistent tone to prepare students for their future careers. - Integrates the most recent FASB updates in both print and digital content, including Leases, Financial Instruments, Revenue Recognition, and more.